Paul Kurzawinski wins this week with a nice score of 150. Jerry McKnight keeps the lead in the second half standings. Congratulations to Jerry and Paul. Clint Duckworth keeps the lead for Weekly wins with two stand alone wins. Note the race is televised on Fox Sunday afternoon. Place your picks before the green flag drops. Good luck all. 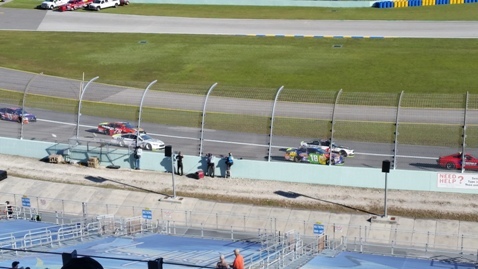 Please visit the "Make Picks" page and enter your race picks BEFORE the green flag drops each race. Your Weekly Points are the total points accumulated for your three drivers eachweek as designated by Nascar. Make sure your picks are for drivers that have selected the Sprint Cup Series as their points series. Drivers that haven't declared the Sprint Cup Series as their points series accumulate 0 points for Sprint Cup races. Also, make sure your picks are for valid race teams. The 04 car is not the same as the 4 car. Please visit the Player's Info page and make sure your e-mail is correct. If not, contact Bill Warner at wwarner84@aol.com. Web site issues will be communicated through e-mail if necessary. Re-clarification of Overall Wins criteria as stated on the Lagrunta Rules page, Rule #5: Most "individual" weekly wins at end of season is worth 100 Lug Nuts. *If two or more people are tied at end of year in weekly wins then there will be a tie breaker system used - contact Rob Duckworth duckworthrobert@hotmail.com for more info. Don't forget to check out the Overall Wins Page link the side or bottom of the page.